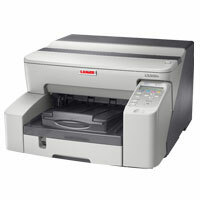 The Lanier GX5050N GelSprinter printer combines the best qualities of inkjet and laser printing. It delivers laser-like color output for a very low cost per page, up to 30 pages per minute, with resolution as high as 3,600 x 1,200 dpi. GelSprinter technology includes quick-drying viscous gel ink, a belt-driven paper feeding system, and a printhead that never needs to be replaced. This affordable, network-ready printer also features a high duty cycle and optional high-yield gel ink cartridges. Use the form below to let Authentic Business Systems know you're interested in the . We'll contact you and provide you with a quote and any additional information you might need. Fields in red are required to send the form. When finished, hit the submit button. Please let us know what you are looking for from your next business machine.